Milt was nearly three years younger than Alex, born on January 27, 1896, to Alex’s March 12, 1893. Alexander Nathaniel Gaston was born in New York City. Milt’s actual first name was Alex’s middle name: Nathaniel Milton Gaston. Their father, Alexander N. Gaston, Sr., was born in County Antrim, Ireland, and came to America in 1872. His own father was born in France and his mother in Ireland. The family lived most of the time in New Jersey, though Alex said he attended elementary school in New York City. His high school was Ridgefield Park in New Jersey, the community where Milt was born. At the time of the 1900 and 1910 censuses, the family lived in Overpeck, Bergen County, New Jersey. Alex Sr. was a driver delivering milk. He and his wife, Catherine, had at least eight children: William, George, Edward, Alexander, James, Nathaniel (Milt), and finally daughters Anna (or Hannah) and Edna. Father Alex remained in the milk business, working as a salesman in 1910 and as a receiving clerk for a milk company in 1920. Young Alex’s first year of professional baseball was with the Haverhill in the New England League in 1914. He played in 66 games as a catcher and hit .213, not necessarily a bad average for a catcher in those days. He was actually under contract to the Providence Grays at the time, but the purchase price had not been paid and as “one of the most promising youngsters in the New England League last season,” it was understood he might revert to Providence.3 He trained in Hot Springs with the Grays but wound up with a different New England League club, the Fitchburg Burghers. He hit just slightly better – .220 – and was more active, appearing in 106 games. The team finished in last place. The next two years, Gaston played in the Eastern League, another Class B circuit. It was Portland (Maine) in 1916, batting .231, and Lawrence (.249) in 1917. He had played for a different team each year, but seen his batting average climb incrementally each year. In 1917, with the World War in progress, Gaston joined the Army Air Service and served until 1919, when he returned at the end of the year in time to play in six games with Providence. In 1920, described before the season began as “big-league caliber,” Gaston had the year that got him an invitation to the major leagues – playing in 111 games at Double-A with Milwaukee and batting .299 at the higher level.4 His contract was purchased by the New York Giants on August 25. He played in his first game with the Giants on September 26. He appeared in four games, and got one base hit and one RBI, walked once, and sacrificed once in 12 plate appearances. In the offseason Alex lived in Teaneck, New Jersey, and worked as a salesman of sporting goods. Playing for John McGraw, Gaston was the third catcher on the Giants from 1921 through 1923, getting into 58 games over the three seasons and batting .227, .192, and .205, but he made only four errors in his 62 games for the Giants in 1920-23. Gaston was small for a catcher, standing 5-feet-8½ and weighing 170 pounds. He was sometimes used to coach at third base. Though eligible to play in the 1921. 1922, and 1923 World Series, he was not called upon in any of them. That December the Boston Red Sox acquired Gaston by trading catcher Johnnie Heving and infielder Bud Connolly to Toledo. Gaston, the Boston Globe’s James C. O’Leary wrote at the time, was “the best catcher in the American Association.”6 His arm was his strong point, and runners who took a lead off first by as much as three feet did so at their own peril. But in February 1926, Picinich was sold to Cincinnati. Alex’s return to the majors him a chance to play against his brother. Milt Gaston had begun his own big-league career pitching for the St. Louis Browns in 1924. He was a 15-game winner in 1925. How did Alex and Milt fare when the two brothers squared off against each other? The two teams faced each other 16 times (including the tie) before the time came when Alex dug into the batter’s box to face his younger brother. It was the second inning of the second game of the August 16 doubleheader, at Fenway Park. And the bases were loaded at the time. The Red Sox had lost the first game, 6-1. Ford Sawyer wrote in the Boston Globe, “On the sun-baked diamonds of our national pastime sentiment is unknown and brotherly love is a thing not recognized. Many must sometimes battle against his dearest chum for a regular’s post, cousin struggle with cousin for the same playing berth, brother contends against brother for the old ball game.” There was one out and no score in the game. “No brotherly love stuff now!” a fan reportedly cried out. No worries. Alex banged a triple to left center, clearing the bases, and providing all the runs Boston needed to defeat brother Milt, 7-1. They faced each other once more, on September 12. Again it was a doubleheader, this time in Sportsman’s Park, St. Louis. Alex went 3-for-5 in the first game, which Boston took, 11-3. Milt started game two and held the Red Sox to just two hits in a 1-0 complete-game win. Only one Bosox reached second base. Of the two hits, though, the first one was by brother Alex, a single in the third inning. Milt got the win. In December 1926 Boston traded three players to St. Paul (pitchers Fred Heimach and Paul Zahniser, and Alex Gaston) for infielder Pee Wee Wanninger and catcher Fred Hofmann. Gaston spent the 1927 and 1928 seasons playing in St. Paul for the Saints, back in the American Association. He hit .305 the first year and .275, with a little more power, the second. On December 5, 1928, the Red Sox reacquired Alex (and Russ Scarritt) in exchange for Slim Harriss and Billy Rogell. 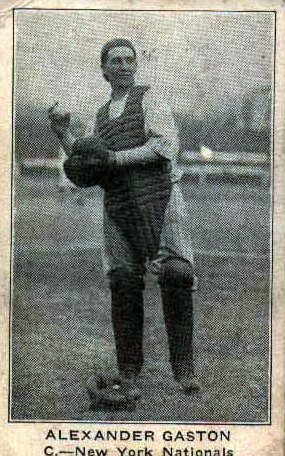 The Globe’s O’Leary remembered Gaston’s year with Boston, noting that he’d caught the bulk of the games: “Although not always in the best physical shape, he was a conscientious hard-working backstop.”9 It would be Gaston’s third trial in the big leagues, this time playing for former catcher and Red Sox manager Bill Carrigan. Ten days later the Sox returned shortstop Buddy Myer to the Washington Senators and got five players in exchange. One was Milt Gaston, who had moved from the Browns to the Senators. The two brothers had wanted to play on the same team and now had the opportunity. Alex appeared in 55 games and Milt in 39. Milt won 12 and lost 19 that year – his .387 winning percentage, though, was better than the team’s. Boston came in dead last again that year, with a record of 58-96, a .377 percentage. Alex did his best to help the cause; he improved on his 1926 average, but by the slimmest of margins: he hit .224 instead of 1926’s .223. He did bang two of his three career home runs, but that was it for Alex in the major leagues. He drove in only nine runs in 127 plate appearances. Milt soldiered on for another five years. How often were Alex and Milt batterymates and how did the team fare when the brothers teamed up? The first time Milt and Alex were the battery, it was Milt who got battered. His first start for the Red Sox was not an auspicious one. It was May Day 1929 and a distress call went out early in the game. Milt lost to the Athletics, a game with a final score of 24-6, which occasioned the Globe subhead “All Fenway Park Hitting Marks Smashed.” Gaston (Milt) was gone after 1? innings, having given up eight runs and walked two. He took the loss. The Red Sox used 21 players in the game, but the only one to play the entire game was Alex Gaston, who went 3-for-5 and actually had himself a good game – except, possibly, in terms of calling the game from behind the plate. Milt took the mound again on May 6. This time he gave up nine hits and a walk (and five runs) in six innings. The Tigers’ Harry Heilmann was responsible for all five runs – a two-run homer in the first, an RBI single in the third, and another two-run homer in the fifth. Final score: Detroit 8, Boston 4. Milt managed to secure a single for himself in the game, and brother Alex went 1-for-3. Just three days later, on May 9, Milt was pleased when the Red Sox scored twice in the first and added another run later, but the Indians tied it up in the sixth and won 4-3 in the ninth. Alex didn’t help much. He went 0-for-3. Milt lost his next two starts, too. Alex didn’t play in either or those, nor did he play on May 28 when Milt finally earned himself a win. It was June 13 before they appeared as batterymates again, this time because Red Sox catcher Charlie Berry had been ejected. Alex was 0-for-1, with a sacrifice. Milt got himself a 4-1 win. June 17: Both started in game two of a doubleheader, Alex going 1-for-3. They lost, Milt yielding 13 hits and two walks in seven innings. On June 22, Milt pitched in the first game and lost, walking in the winning run in the tenth inning. Alex appeared in the second game, taking Heving’s place, and went 0-for-. Milt continued to pitch – got himself a homer on July 4 off Lefty Grove (in a 3-1 Philadelphia win); his error on July 20 cost the Sox that game. The next time the Gastons played together was July 26, Milt suffering a 4-1 defeat to Detroit. Alex spelled Berry in midgame and went 0-for-1 but scored the only Red Sox run. On July 31 Alex played in game one and pinch-hit in the second game (unsuccessfully) as Milt absorbed another defeat. On September 2 Milt pitched and won game two on that day’s twin bill, but the only game brother Alex played in was the first. On September 8 they played a doubleheader at Braves Field (it being Sunday). Just as back on July 24, 1926, when the two brothers squared off against each other, the second game was also called a few minutes before the 6 P.M. curfew. Milt started and held St. Louis scoreless through ten innings. Since the Red Sox had managed only three hits (two of them by Alex) and failed to score as well, the game ended 0-0. Both ties involved the St. Louis Browns; the 1926 game had Milt pitching for them and this one had Milt pitching against them. On September 14 Milt gave up only five hits (though he walked six batters and threw a wild pitch), losing to the Tigers, 2-1. Each brother batted three times; neither got a hit. The last game they both appeared in was on September 19, Alex went 0-for-2 but Milt helped his own cause. Alex was safe on an error in the fifth. The next batter made an out, and then Milt doubled. A couple of batters later, Milt himself scored with what proved to be the winning run. All in all, one couldn’t say it was that inspiring a collaboration. The Red Sox, as they had throughout most of the 1920s, finished last. Milt was 12-19 in 1929, 13-20 the next year, and then a dismal 2-13 for Boston in 1931. He pitched three more years, for the White Sox, and then left the game. He died in 1996 in Hyannis, Massachusetts, at the age of 100. Alex was released outright to San Francisco on December 16, 1929, reportedly sold for $10,000.10 He played nine more seasons in minor-league ball. He hit a career-high 11 home runs for San Francisco in 1930, batting .286. Then he was a man on the move, sold to the Seattle Indians in April 1931 (for $13,000) and then (after refusing to take a salary cut for 1932) moving on to Oakland. In 1933, Gaston signed as a free agent with Baltimore, but moved on during the season to Kansas City, and had a very disappointing combined .185 batting average for the two Double-A teams. He began 1934 with Kansas City but was soon sent to Class A Des Moines, where he hit .304. From 1935 through 1937, Gaston stayed put, as the backup catcher for the Dallas Steers in the Texas League. He’d been a player-manager part of 1934 with Des Moines, and again with Dallas in 1935, taking over as manager in mid-May. Gaston was a coach for the Jersey City Giants in 1938, and appeared in six games, his last games in Organized Baseball. After the season, Josh Billings was named in his stead. After baseball, Gaston took a position as branch manager for a life insurance company in Dallas. He and his wife, the former Virginia Weiss (they had married in 1924), had two children, Robert and Barbara. At the time of World War II, he lived in Teaneck, New Jersey, and worked for Acacia Mutual Life Insurance. Nearly 20 years later, he was still living in Teaneck, as a sales representative handling executive accounts for American District Telegraph Company. Alex lived to age 85, dying in Marina Del Rey, California, on February 8, 1979. In addition to the sources noted in this biography, the author also accessed Gaston’s player file and player questionnaire from the National Baseball Hall of Fame, the Baseball Necrology, the Encyclopedia of Minor League Baseball, Retrosheet.org, and Baseball-Reference.com. Portions of this biography are drawn from the author’s book Red Sox Threads. 1 The Sporting News, June 9, 1979. 2 The Oregonian (Portland), May 21, 1929. 3 Sporting Life, February 13, 1915. 4 The description appeared in the Evansville Courier, March 30, 1920. 5 Chicago Tribune, June 16, 1925. 6 Boston Globe, December 11, 1925. 7 Cleveland Plain Dealer, January 19, 1926. 8 Boston Herald, December 6, 1928. 9 Boston Globe, December 6, 1928. 10 San Diego Union, December 17, 1929. 11 Dallas Morning News, February 16, 1928.